As work continues on one of the most exciting urban bike trail projects in the country — The 606/Bloomingdale Trail — we at Bike Walk Logan Square ask a crucial question. How will Logan Square residents get there? Having reviewed the Streets for Cycling 2020 plan (pdf), we highlight a number of important routes that we suggest prioritizing, and we point out some gaps in the bicycle network that, ideally, ought to be addressed. In this post, we begin at the western end of the Trail, where there will be trail access points on Ridgedale Ave and Lawndale Ave. The McCormick Tribune YMCA sits just north of the trail on Lawndale, which promises to be a popular destination for trail users. However, north and west of the trail, cyclists encounter some holes in the network. 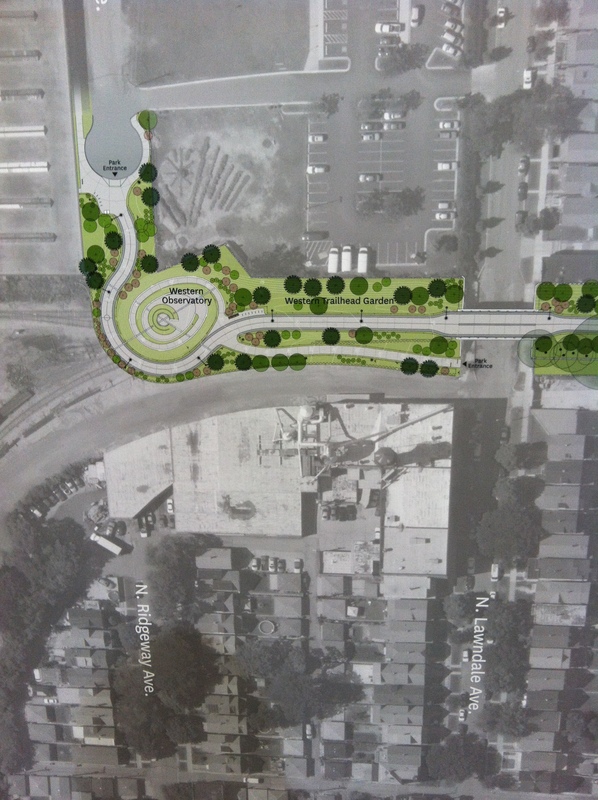 The 606 Access at Ridgedale and Lawndale, Image courtesy of The Trust for Public Land, as presented at the public meeting on June 18, 2013. First, Lawndale is blocked just south of Armitage Ave. Bikes can squeeze through the cuts in the curb, but a dedicated bike route (which Lawndale is in the Streets for Cycling 2020 plan) should better accommodate bicycles. Second, Ridgeway Ave is not a bike route. It easily connects to bike routes on Cortland Ave and then Hamlin Ave. Considering the level of bicycle traffic that we expect will follow that route, it makes sense to declare Ridgeway a bike route, at least between the trail and Cortland Ave.
Third, a couple of blocks north of the trail, on the other side of Armitage, cyclists will find that there are two bike routes on one-way southbound streets (Hamlin and Lawndale). Unless one of those streets is made to accommodate northbound cyclists, bikers will have two southbound bike routes but no northbound route. Another important consideration is how cyclists will travel east and west when they are north of the trail. 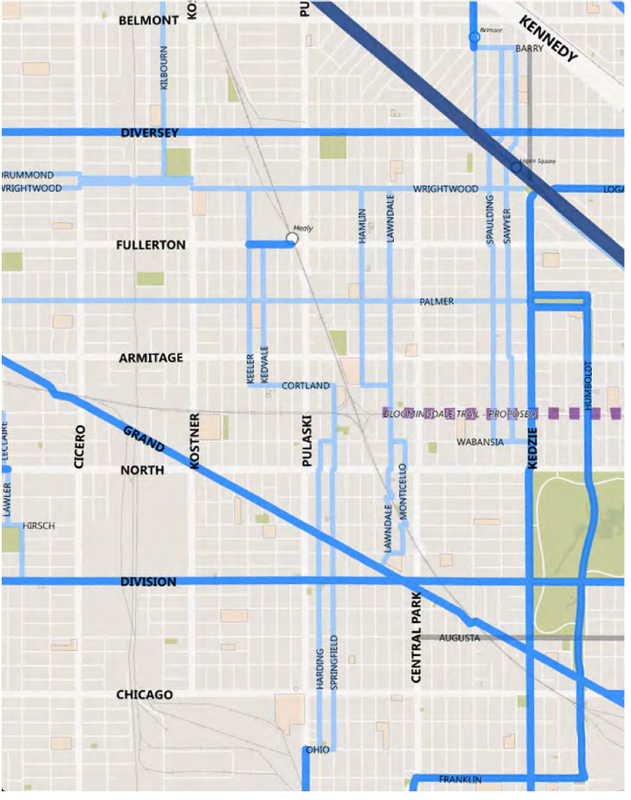 Both Palmer St. and Wrightwood Ave. are slated to become bike routes extending through the neighborhood (and much further west). Both have been suggested as possible neighborhood greenways (similar to Berteau Ave on the north side). And both will be important for many Logan Square residents to safely access the trail on bike. It is therefore critical that bike infrastructure on Palmer and Wrightwood be well implemented. Our recommendations have been sent to the Chicago Department of Transportation, with support from Alderman Rey Colón. A handful of wards intersect at or near The 606. They include the 1st Ward (Joe Moreno), 26th Ward (Roberto Maldonado), 30th Ward (Ariel Reboyras), 31st Ward (Ray Suarez), 32nd Ward (Scott Waguespack), 33rd Ward (Deb Mell), and 35th Ward (Rey Colón). This map of Logan Square wards can help you see where you are and which wards you will travel through on your way to The 606. 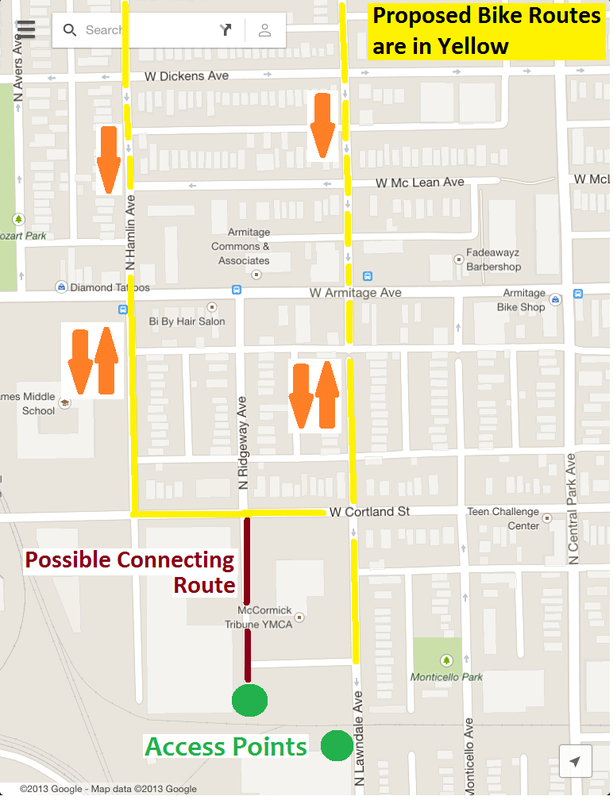 Please consider contacting your alderman to tell him or her that you want safe access to The 606 for bicyclists and pedestrians. The 606 will surely be a wonderful addition to our neighborhood. Let’s do what we can to make sure our neighbors can get to it safely. And let’s hope it sparks a web of complete streets infrastructure that reaches into Logan Square and beyond.